Finding new contacts and building relationships is the lifeblood of a commercial real estate broker. You need to know exactly who your prospects are, and more importantly, what to say to pique their interest and gain their trust. We've said it before and we'll say it again: to capture a prospect's attention and earn their respect, you need to be interesting, relevant and timely. You need to offer them information from the start to convince them that you know what you’re talking about. If you have a good database and know the players involved, you can contact them with concrete information that’s relevant to them. The expertise is yours, but technology can make it easier to find the right people and start the right conversations at the right time. To get more specific, here are a few examples of ways to approach prospects with these topics. 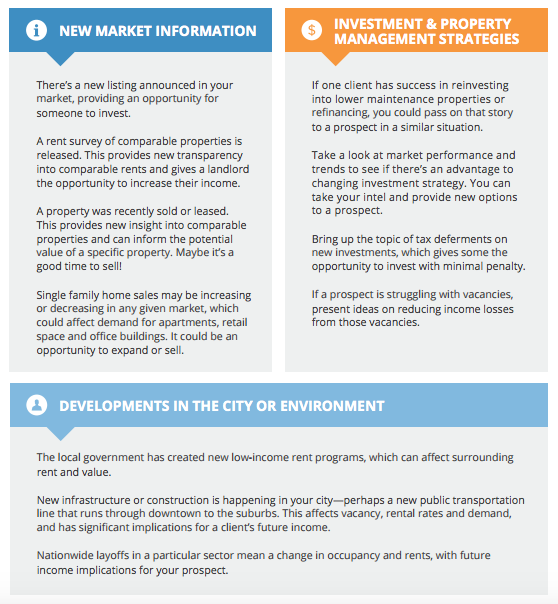 For more tactics and strategies to be a better broker, read The Commercial Real Estate Best Practices Toolkit.